CONNECTING THE LINCOLN TUNNEL TO THE TURNPIKE: Plans for the Lincoln Tunnel and its approaches were first announced in 1930, when the Port of New York Authority proposed a $62 million, twin-tube tunnel under the Hudson River between West 38th Street and Weehawken, New Jersey. On the western shore of the Hudson, the tunnel was to connect to NJ 3. The first tube of the tunnel opened in December 1937, and the second tube opened in February 1945. A third tunnel tube opened in May 1957, providing a total of six lanes of capacity among the three tubes. 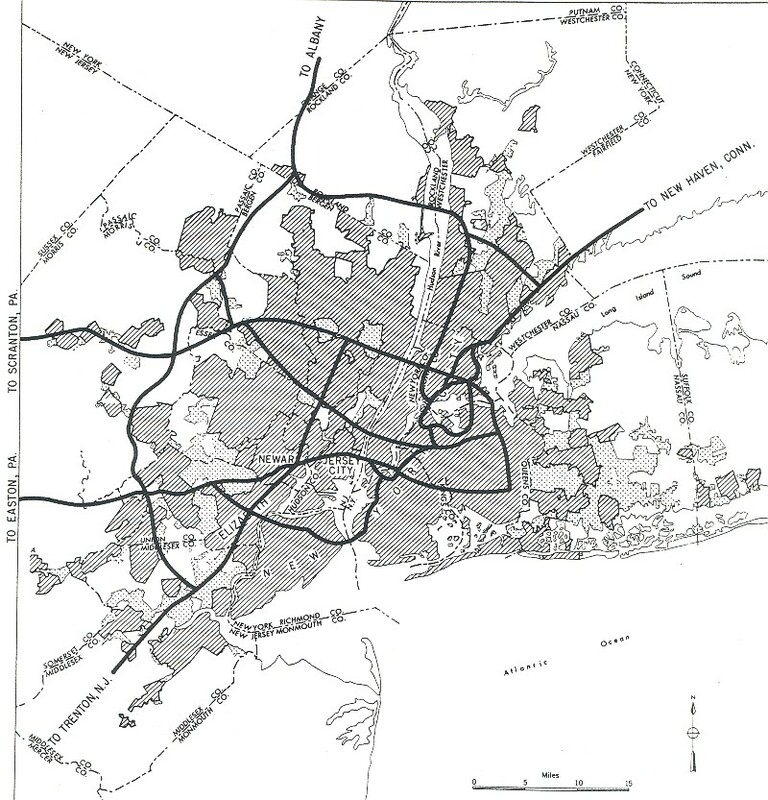 The original Lincoln Tunnel proposal included a land tunnel extension from the toll plaza west through Bergen Hill, ending at Tonnelle Avenue (US 1-US 9) in North Bergen. Instead of constructing the land tunnel, the Port Authority constructed a 360-degree, elevated "helix" that brought the six-lane highway from atop the palisades of Weehawken down to the Lincoln Tunnel toll plaza. The 2.6-mile-long connecting freeway through North Bergen, Union City and Weehawken, which was designated NJ 3, was opened by the Port Authority in December 1937. With its six 11-foot-wide lanes, lack of shoulders and inadequate acceleration and deceleration lanes, the road reflects pre-Interstate standards. The stone-arch overpasses along this section reflected the contemporary standards established by Robert Moses. The speed limit is 50 MPH, except 40 MPH around the "helix." In 1952, the Port Authority and the New Jersey Turnpike Authority extended the Lincoln Tunnel western approach for 0.9 mile west to EXIT 16 of the recently opened New Jersey Turnpike in Secaucus. The extension provided for grade-separated interchanges for US 1-US 9 and NJ 3, as well as for a toll plaza. The 1937 and 1952 sections were constructed at a cost of $16.9 million. The Lincoln Tunnel Approach became part of the Interstate highway system in 1956. As part of the original "FAI Corridor 105," the Interstate highway was originally planned to traverse the NJ 3 corridor northwest to I-80. After the New Jersey State Highway Department convinced the Federal Bureau of Public Roads (BPR) that bringing the NJ 3 Freeway up to Interstate standards would be prohibitively expensive, the "FAI Corridor 105" route was shifted to the current I-280. Nevertheless, the NJ 3 link between the New Jersey Turnpike and the Lincoln Tunnel received the I-495 designation in September 1958. When Interstate status was granted to the Lincoln Tunnel Approach, the New Jersey State Highway Department took over maintenance of the freeway between mileposts 0.8 and 1.9. The New Jersey Turnpike Authority maintained jurisdiction west of milepost 0.8, while the Port Authority maintained jurisdiction east of milepost 1.9. Soon thereafter, the New Jersey State Highway Department reconstructed the western end of the freeway to bring it up to Interstate standards. This project included the reconstruction of the eastern end of NJ 3, as well as the reconfiguration of EXIT 16 and EXIT 17 on the New Jersey Turnpike (I-95). THE NJ 495 FREEWAY XBL (EXPRESS BUS LANE): One of the earliest high-occupancy vehicle lanes in the nation can be found on the eastbound lanes of the NJ 495 Freeway. The Port Authority began studies of the idea in 1963, and tested the eastbound bus-only lane over the next two years. In 1970, the Port Authority and the New Jersey Department of Transportation (NJDOT) began a one-year trial of the express bus lane. The high-occupancy vehicle lane, which was to be in effect during the morning rush hour, changed the existing six-lane (3-3) configuration to four lanes eastbound, and two lanes westbound. Eastbound buses used the innermost westbound lane. The "XBL lane" trial cost $1.5 million to implement, mostly for the installation of new lane signals. In 1972, after determining that the express bus lane saved commuters an average of ten minutes, the Port Authority and the NJDOT made the peak-period "XBL lane" permanent. CURRENT AND FUTURE IMPROVEMENTS: According to the NJDOT, the NJ 495 Freeway carries approximately 160,000 vehicles per day (AADT) at its western terminus (I-95 / US 1-US 9 / NJ 3), falling to approximately 120,000 vehicles per day at the Lincoln Tunnel. In 2003, the NJDOT rebuilt the interchange between the NJ 495 Freeway, the NJ 3 Freeway and US 1-US 9 (Tonnelle Avenue). The $16 million project featured the modification of ramps between NJ 3, NJ 495 and US 1-US 9, the construction of a third southbound lane on US 1-US 9, and the rebuilding of the US 1-US 9 bridge over the Amtrak-NJ Transit Northeast Corridor line. The Lincoln Tunnel Approach should be re-designated I-495, and reconstructed to conform to current standards. Here, I believe that a "3-3-3" configuration should suffice. The center three lanes should be used for separate express bus lanes, with the center lane reversible as necessary. The helix, which is beginning to fall apart (I've seen the exposed wire mesh to prove it), should be completely redesigned and rebuilt. This part of the project could even include the erection of a new maintenance garage, as well as the construction of new tunnels for local streets. How often do you think I've seen the Shadow Traffic reports on TV and wondered, "When is that old rust-bucket going to come crashing down upon the people of Weehawken?" The highway cannot be built to Interstate standards without complete disruption to northern Hudson County. There is no room to make the lanes 12 feet wide while adding Interstate-standard shoulders and acceleration-deceleration ramps. To make such room, the bedrock on which that entire region is built upon would have to be blasted away, and 30th Street and 31st Street would either have to be combined into a single two-way avenue or both eliminated. Such extensive work would cause chaos to the residents of North Bergen, Union City, Weehawken, and Hoboken in the immediate vicinity of the highway. For these reasons, the NJDOT cashed in the Interstate highway funding. They knew it was logistically impossible to bring I-495 up to current specifications, so they re-designated it a state highway that could exist in its current form. The only other alternative would be to create an elevated roadway above the existing one, but also at bridge height over the cross streets (in other words, a highway some 30 feet above the existing one to serve as opposite flow). The logistical problem there, of course, is an incredibly steep downgrade to get to the tunnel eastbound, or a steep climb westbound that trucks and buses would struggle to make. The only real solution to alleviate the existing traffic that would cause a minimum of disruption would be to send an exclusive busway through the old rail tunnels from the New Jersey Turnpike to the harbor, then to its own underwater tunnel to the Port Authority Bus Terminal in Manhattan. SOURCES: "Tunnel Plan Ready for Legislature," The New York Times (1/13/1930); "Third Lincoln Tube Voted by Port Unit, To Cost $85 Million" by Joseph C. Ingraham, The New York Times (3/09/1951); "FAI 105 Interstate Highway Corridor: Recommendation Report," New Jersey State Highway Department (1957); "New Roads with New Numbers Will Parallel Old U.S. Routes" by George Cable Wright, The New York Times (9/19/1958); Regional Highways: Status Report, Tri-State Transportation Commission (1962); "Interstate 495 Exclusive Bus Lane," Tri-State Regional Planning Commission (1972); New Jersey Department of Transportation; Ralph Herman; Daniel T. Dey; K.C. Jackson; Raymond C. Martin; Christopher G. Mason; Dan Moraseski; William F. Yurasko. NJ 495 and I-495 shields by Ralph Herman. HOV lane sign by C.C. Slater. NJ 495 Freeway: eastbound and westbound exit lists.